“Tales of the City” Highlights SF International Film Festival. Art film lovers know that April heralds the annual arrival of the SFFILM Festival. But there are some differences for this 62nd edition. First, the two-week event runs a bit early this year, going from April 10-23, 2019. Second, there aren’t any really late screenings where patrons emerge from the screening venue after midnight. Fortunately, several familiar venues such as the Castro Theatre, the Roxie Theatre, the Pacific Film Archive, and the Creativity Theatre have made their spaces available for patrons to enjoy this year’s festival offerings. Things get off to a roaring start with the Opening Night Film, the hotly anticipated “Armistead Maupin’s Tales Of The City.” The Festival is showing only the first episode of the Netflix reboot, but it compensates by having personal appearances by creator Armistead Maupin and executive producer/star Laura Linney. Judging from the catalog description, at least “Mary Ann In Autumn” is being adapted with Linney reprising her iconic Mary Ann Singleton role. Another hotly anticipated TV series getting an episode screened at the Festival is “United Shades Of America.” The W. Kamau Bell-hosted documentary series looks at life in 21st Century America. The episode being shown takes Bell to Mississippi, a flashpoint in America’s fight over reproductive justice and access. 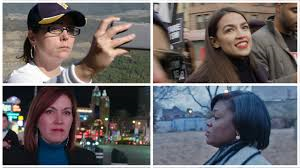 Four contested elections are chronicled in the rousing Rachel Lears documentary “Knock Down The House.” The film follows four women running underdog grassroots campaigns against entrenched male Congressional Democratic incumbents. One of the women featured in the film is Alexandria Ocasio-Cortez. In Ognjen Glavonic’s drama “The Load,” Serbian government driver-for-hire Vlada is tasked with driving a plain white cargo van from Kosovo to Belgrade. The contents of the cargo van and what befalls Vlada on the journey forces him to confront his culpability in his government’s wartime actions. Qiu Sheng’s feature debut “Suburban Birds” travels through more enigmatic fictional territory. Land surveyors try to solve the riddle of a mysteriously tilting building. A group of kids search for a friend who’s disappeared from school. How are these two stories connected? Approaching this film as you would an Apichatpong Weerasethakul film offers a key to comprehension. An even more unusual cinematic experience can be found in Jodie Mack’s “The Grand Bizarre.” This experimental documentary could be called a worldwide tour of the nature of hand-crafted work. Stop-motion animated textile samples and the footage of different landscapes around the world are keys to comprehension. In the documentary “The Edge Of Democracy,” director Petra Costa captures the fragile nature of democracy in Brazil. Costa’s historical survey begins in 1985 and pays particular attention to the careers of Luiz Inacio “Lula” da Silva and Dilma Rousseff. Did officials’ secrecy and public ignorance eventually pave the way for the rise of authoritarian Jair Bolsonaro? Centerpiece film Lulu Wang’s “The Farewell” stars Awkwafina as a broke Los Angeles artist who returns to China for an uncomfortable family reunion. The occasion is the impending death of a grandmother. The only problem is, the old woman is the only one who doesn’t know she’s seriously ill and nobody can bring themselves to tell her. In the Sundance Grand Jury Prize winner for US Documentary, Nanfu Wang and Jialing Zhang’s “One Child Nation” looks at the long-term ramifications of China’s one-child policy. A trip to Wang’s home village leads to family stories about such horrors as forced sterilization and deliberate child abandonment. Luke Lorentzen’s documentary “Midnight Family” takes viewers inside a Mexico City-based private ambulance service. The Ochoas, the clan that runs this service, provide a supplement to the country’s inadequate public health system. But being a private concern doesn’t necessarily mean the Ochoas make better life-and-death decisions. Viewers who missed out on previous theatrical showings of the charming Academy Award-nominated animated short “One Small Step” or the Chow Yun-Fat crime thriller “Project Gutenberg” now have a second chance to catch these films. The animated short, the story of a Chinese-American San Franciscan whose lifelong dream of becoming an astronaut is supported by her cobbler father, screens as part of Shorts Program 6: Family Films. The Chinese crime drama, from the scriptwriter for “Infernal Affairs,” concerns the Chinese police’s attempt to nail currency forging mastermind Painter (Chow) by getting Painter associate Lee Man to tell the story of his history with the elusive criminal. Several SFFILM offerings have already gone to At Rush as of this writing. Worth making an attempt to score a last minute ticket are the following: the above-mentioned “Armistead Maupin’s Tales Of The City”; “Q Ball” (Golden State Warriors player Kevin Durant will appear in person as a co-producer on this documentary about the San Quentin Warriors basketball team, whose members include promising basketball players with careers derailed by felony convictions); and “Claire Denis: Tribute & ‘High Life’” (the French director, whose previously screened films at SFFILM have included “Beau Travail” and “35 Shots Of Rum,” makes an in-person appearance with her new film, a drama set aboard a spaceship filled with death-row convicts sent to perform dangerous space explorations). Moonika Siimets’ chilling “The Little Comrade” shows the slow creep of authoritarianism into a 1950s rural Estonian village. Its viewpoint character is a 6-year-old girl who can’t understand why her father doesn’t share her enthusiasm for the “young pioneers” marching at school. Ulrich Kohler’s post-apocalyptic dark comedy “In My Room” asks what if the supposed last man on Earth wasn’t all that interested in surviving or restarting the human race? And what if the Apocalypse wasn’t a big disastrous event? Hassan Fazili’s documentary “Midnight Traveler” follows the efforts of Fazili’s family to flee Afghanistan. The footage recording the Fazili family’s time on the road, which include meeting smugglers and refugee camp stays, was captured on three cell phones. This year’s State Of Cinema Address will be given by Coup frontman turned filmmaker Boots Riley. The director of the hit film “Sorry To Bother You” will reflect on how modern social movements have pushed filmmakers to up their creativity game to capture these movements’ truths. This year’s Persistence Of Vision Award goes to Madeline Anderson. In the 1960s, this black documentary filmmaker broke several industry paths such as being the first American-born black woman to produce and direct a television documentary film. Two Anderson documentaries to be screened at the event show her feminist take on 1960s Civil Rights struggles. Ryusuke Hamaguchi, director of the amazing “Happy Hour,” returns with “Asako I & II.” In Osaka, Asako falls deeply in love with Baku, who mysteriously disappears six months later. In Tokyo, the heartbroken Asako meets Ryohei, a doppelganger for Baku who denies knowing who Baku is. Legendary director Werner Herzog is joined by Andre Singer for the documentary “Meeting Gorbachev.” The Russian leader who helped end the Cold War tells the story of his life in his own words…despite Herzog’s attempts to steer the conversations his way. One of the most unusual war films shown at the festival is Alejandro Landes’ “Monos.” A group of teen rebel soldiers in an unnamed country find their job of guarding the Doctora complicated by a government military attack and the Doctora’s own escape attempt. Their retreat deeper into the jungle soon unmoors the soldiers a la “Apocalypse Now.” Yet “Lord of the Flies” also describes what happens to these young troopers. Tamara Kotevska and Lubomir Stefanov’s Sundance award-winning documentary “Honeyland” concerns a lonely beekeeper living in Macedonia’s mountains. Her new neighbors offer relief from solitude…until their interest in beekeeping leads them to blow off her expert advice. For something a bit lighter, why not see what can be done with extreme dog grooming? In Rebecca Stern’s documentary “Well Groomed,” you will not believe what’s entered into the annual Groom Expo. Who knew dog fur can become the medium for insane works of art such as ET and a full farm? The SFFILM Festival wraps things up with Gavin Hood’s Closing Night Film “Official Secrets.” Keira Knightley plays British intelligence service worker Katharine Gun, who’s distressed at discovering an e-mail showing the British government is pressuring smaller countries to support the invasion of Iraq. Gun’s leaking of that e-mail to the British press eventually leads to her being charged with treason. The films mentioned above are just a sampling of what will be playing at this year’s SFFILM Festival. Other viewers may be interested in seeing Laura Dern or John C. Reilly in person. Still others may prefer watching films about Toni Morrison (“Toni Morrison: The Pieces I Am”), a dance adaptation of a Henry James story (“The Beast In The Jungle”), or even a violent historical revenge tale from the director of “The Babadook” (“The Nightingale”). All the reader needs to do is choose.